A SeaWorld promotional video encourages guests to come and visit Kayla, the largest female killer whale at their Orlando whale jail. At 5,900 pounds and 19 feet long, Kayla, for good reason, drew in crowds. Unfortunately, her fame ended in tragedy as, without any explanation, SeaWorld announced that she has died this week. 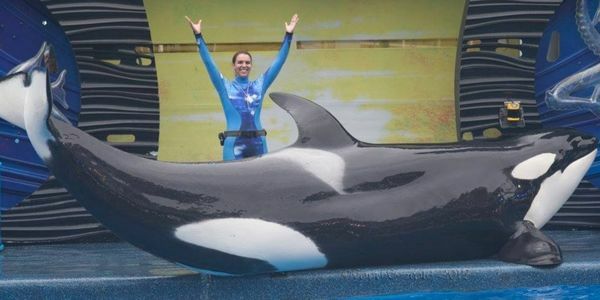 Kayla who was 30 years old, passed at the prime of her life, after suffering the indignity of a lifetime in captivity performing for the paying public. Now SeaWorld vets are keeping a close eye on the remaining 5 orcas at their facility. In a statement, SeaWorld said, "Kayla inspired generations of guests and employees to care and learn more about this amazing species." While that might certainly be true, she doesn't seem to have to have inspired the company itself to end its much-criticized orca captivity and performance program that currently holds 20 of these incredible animals prison in their "parks" across the United States. Orcas in the wild can live up to 80 or 90 years, but orcas in captivity are lucky to live half that long. According to SeaWorld of Hurt, the average age of death for orcas who have died at SeaWorld is 14 years old. That means that everytime SeaWorld decides to bring another orca into their park they are actively cutting its life expectancy in half. It's time SeaWorld put their money where their mouth is. They claim to love their orcas but by keeping them prisoners, they aren't loving them, they are causing them to die short and unfulfilled deaths. Tell SeaWorld to end their orca captivity program. Sign the petition and tell them to release their orcas to a proper sanctuary where they can live the rest of their lives in relative freedom.